Ho Chi Minh City, Vietnam, 2018-Aug-21 — /Travel PR News/ — Vietjet opens sales on its Hanoi- Tokyo (Narita, Japan)route. This is the carrier’s third route to Japan, along with the other two routes connecting Vietnam to Japan (Hanoi to Osaka and Ho Chi Minh City to Osaka), to further meet with travelling and trading demands between the two countries. Hanoi– Tokyo (Japan) route will operate a daily return flight, starting January 11th, 2019 with flight time of more than five hours per leg. The flight departs from Hanoi at 00:55 and arrives at Tokyo at 08:00 (local time). The return flight takes off at 09:30 at Tokyo (local time) and lands in Hanoi at 14:00. Welcome the new route, Vietjet offers three golden days on August 22nd, 23rd, 24th, 2018 with 2.5 million tickets priced only from VND0 (*) on website www.vietjetair.com. The promotional tickets are applied on all domestic and international routes to Tokyo, Osaka (Japan)/ Seoul, Busan, Daegu (South Korea)/ Hong Kong/ Kaohsiung, Taipei, Taichung, Tainan (Taiwan)/ Singapore/ Bangkok, Phuket, Chiang Mai (Thailand)/ Kuala Lumpur (Malaysia)/ Yangon (Myanmar)/ Phnom Penh, Siem Reap (Cambodia) with flight period from September 5th, 2018 to June 30th, 2019 (**). Especially the Hanoi – Osaka (Japan) route is from November 8th, 2018, Ho Chi Minh City – Osaka route from December 14th, 2018 and Hanoi – Tokyo route from January 11th, 2019. The promotional tickets are available via sales channels during Vietjet’s golden hours from 12:00 to 14:00 (GMT+7) everyday on www.vietjetair.com (also compatible with smartphones at https://m.vietjetair.com) or www.facebook.com/vietjetvietnam (just click the “Booking” tab). Payment can be easily made with international debit and credit cards, including Visa/ MasterCard/ AMEX/ JCB/ KCP/Union; or with any ATM card issued by 34 Vietnamese banks and registered with internet banking. 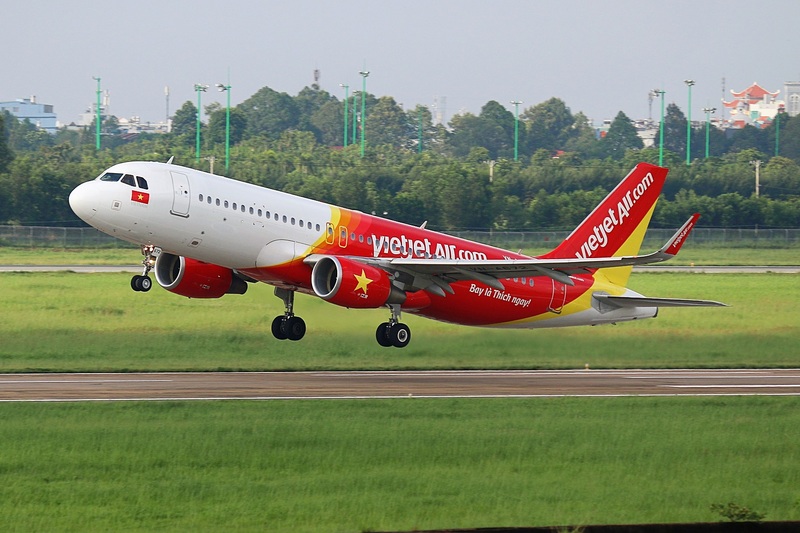 Aiming to be a Consumer Airline, Vietjet has continually opened many new routes, added more aircrafts, invested in modern technology, while offering more add-on products and services to serve all demands of customers. Since launching operations in 2011, Vietjet has been a pioneering airline, winning the hearts of millions of travelers thanks to its exciting promotions, entertainments, especially during the festive seasons and on various holidays through the year. With high-quality services, diverse ticket classes and special low-cost air fares, Vietjet offers its passengers flying experiences on new aircraft with comfy seats and delicious hot meals served by dedicated and friendly cabin crews, and many more enticing add-on services. This entry was posted in Airlines, Airports, Flights, Travel, Travel Services, Travelers and tagged flights, Hanoi, Tokyo, Vietjet. Bookmark the permalink.